I know, I know....it's about a month past, but my mom sent some fun pictures from her camera. I only took my still camera to NC, so NONE of my pictures are develpoed yet. Sad I know. 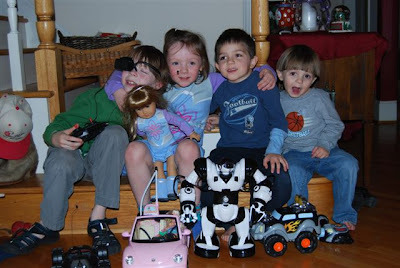 Anyway, her are some pictures of most of the cousins playing together. Hamiliton didn't get in any of the pictures, because he came later. In one of the pictures everyone is playing with some type of "RC" creature. I don't have any pictures to share from Grandma Jo's house, but we had a great time there as well. We all enjoyed celebrating Christmas morning there. We spent a lot of time hiking, playing soccer, and enjoying our new Candy Land DVD game. Our next stop was to Poppie and Yaya's house. The boys were troopers, but were getting weary as the trip went on, so unfortunately, our time with them was cut short. We did hear some great news while we were there......Aunt Jenna is pregnant!! Yippee! She is due in August, so we will have cousins on that side of the family. We ended our trip going back to Chapel Hill and attended a Carolina game. What an exhilarating time!!!! Chad and I loved the experience and were completely jacked up leaving the game. Talk about energy. Soon after the game, we loaded up the kiddos and drove through the night to get home. Great time with everyone, but home felt so good!!!! !